FORT WORTH, Texas (AP) — Desmond Bane finds it easy to score for No. 21 TCU when Alex Robinson is passing him the ball. 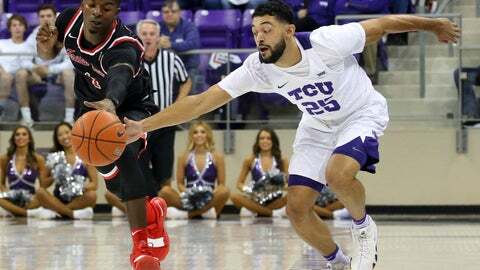 Nembhard’s 3-pointer put TCU up 29-25 with just under 2 minutes left in the first half before the Bulldogs scored the final six points for a 31-29 lead on Huggins’ jumper before the buzzer. Robinson and Bane scored all of the points in a 10-0 TCU run after Fresno scored the game’s opening basket. The Bulldogs got even at 10-all on consecutive 3s by Williams and Huggins, but didn’t have its first lead until Christian Gray’s layup made it 23-22 with 3:17 to go in the first half. Fresno St.: The Bulldogs haven’t won a non-conference game against a Top 25 team since winning 43-42 at Oregon State on Dec. 7, 1982. … They haven’t beaten an AP Top 25 team since a 58-52 win over No. 14 Oklahoma State on Feb. 10, 2002 when Jerry Tarkanian was their coach. TCU: The Frogs have won 18 consecutive November games, and are off to a 3-0 start just like they were in Dixon’s first two seasons. For the point guard, it wasn’t the points or the assists. It was the four turnovers. Fresno State is back in California for Thanksgiving, playing Northwestern that day to start the Wooden Legacy tournament. They will play three games in four days in Fullerton before going home for a seven-day homestand that will be the team’s longest since 1954-55.